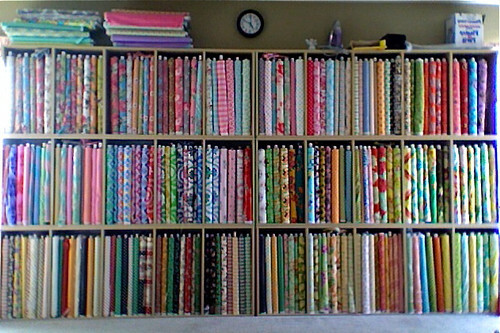 Cleaning up my act - Stop staring and start sewing! Well, I've spent a few days cleaning my sewing room/shop and I was disappointed to find carpet under all that mess. I really wanted hardwood. Anyway, we moved my computer/printer, etc. out of the bedroom and into the sewing room so I don't have to run back and forth all day long. I want to share the view from my computer (minus me sitting here blocking the view). Sorry about the fuzziness but this picture was taken with the webcam in my mac. Isn't that fun? I swept my floor with a broom. That works really great on my carpet because it catches all those long loose threads and things instead of having it get tangled up in my vacuum cleaner. I just throw the pile into the trash and then vacuum the floor to finish it. There's something about a clean floor that just lifts my spirits. So not only do I have a clean room, but Joey and I finally finished our first pattern! 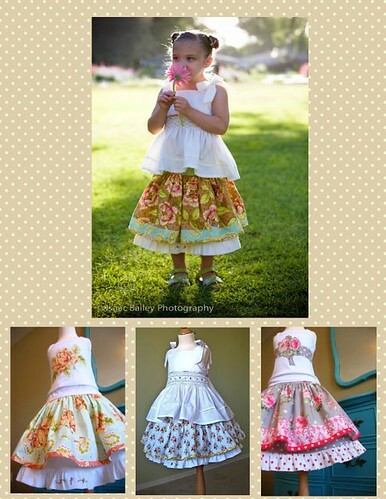 When I made this skirt for Heather's article in Mary Engelbreit's Home Companion (best magazine ever) I had no idea so many people would want the pattern for it and all I had was a piece of paper with all my dimensions jotted down and I really couldn't give that to folks, could I? We're releasing it in PDF format so you can just download it and print it at home. We are planning real paper patterns soon but this was a great way to get started. Anyway, it's 10.00 on my site and no shipping (really! I just email it too you!). You are free to make it for re-sale (unless your last name is Target or Walmart) too. Here's our cover sheet. Nothing too fancy since we're just getting the hang of this. That beautiful top photo was taken by Isaac Bailey. Isn't it dreamy? I also found a fun box of goodies while cleaning my sewing room. 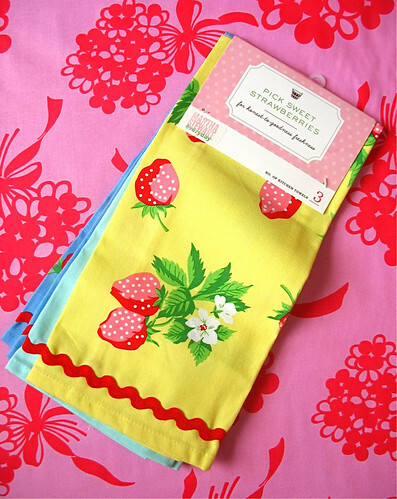 I bought a bunch of these kitchen towels a couple of years ago intending to make aprons or other crafty cute things with them but alas, here they sit. So I thought another give-away would be fun but then I thought if I just give away towels (cute towels!) people might complain (especially after looking at all those fabrics) so I'm giving away a set of towels and 1.5 yards of this fabulous Georgie fuchsia fabric from Jennifer Paganelli's Bell Bottom collection. Oh the things your could do with that! Just leave a comment! Fun!